PC Construction says in its lawsuit against The Federated Cos. that the developer intentionally created a corporate structure to avoid paying its debt to contractors. A Vermont construction company is suing the developers of the stalled “midtown” project in Portland, saying the corporate structure set up by the developers was designed to allow them to walk away without paying some of their contractors. PC Construction Co. said it provided substantial pre-construction services on the project that cost at least $235,000 and received no payment from The Federated Cos., developer of the mixed-use project that still hasn’t broken ground seven years after it was first proposed. The suit alleges that The Federated Cos. “have been playing a shell game” by setting up companies that were thinly capitalized and “making misrepresentations so that they could walk away from the project” without paying their bills. The federal suit names the development company and its owners, Jonathan Cox and Nikolas Wexler, as defendants. The project, first proposed in early 2011, originally called for four, 15-story towers to be built in the city’s Bayside neighborhood, with hundreds of apartments, retail space and parking garages. A neighborhood group filed suit over the 165-foot height of the towers and the developer agreed to scale back the size of the project. The city in March 2015 approved a new plan calling for 445 apartments and retail space in three six-story buildings and an 800-vehicle parking garage, although city officials said details were still in flux. The plan continued to undergo significant changes and delays, including interest in building a hotel as part of the project. In March, the developers missed a deadline to get a building permit for a parking garage, leading the city to withdraw other approvals for the project. The developers have said they will appeal that decision, and the city and the developers have threatened to sue each other over the stalled project. 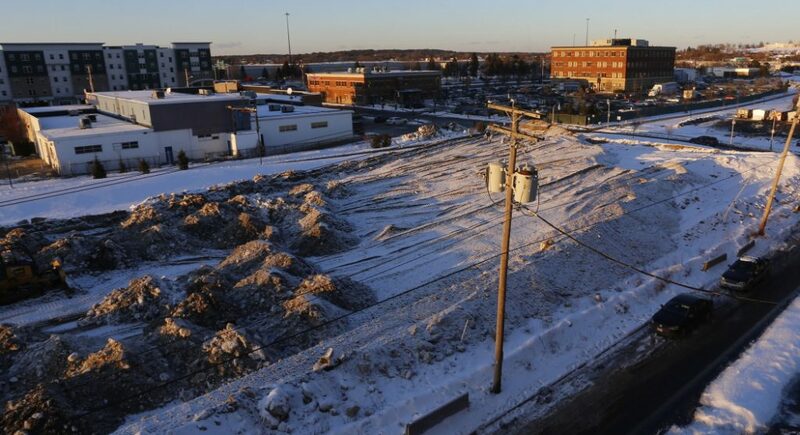 The PC Construction lawsuit, filed in Maine District Court, said that Cox and Wexler’s development company lacked significant financial resources and they set up new companies to hold the real estate and handle the development of the project. But, the suit said, the companies they set up were used mainly to allow them to pull money out of the project and avoid paying bills to contractors, including the Vermont construction company. PC Construction said it was hired to provide scheduling, budget, cost estimating, engineering and other services, including identifying subcontractors to do some of the work on the project. The construction company had agreed to waive its fees if it was selected by Federated to build the project. But as Midtown hit delays, PC Construction and The Federated Cos. entities entered into new contracts and the Vermont company started to ask about getting paid for its work on the project. It asked for nearly $208,000 in early 2017 and $235,000 a year later, but received no replies, the suit said. PC Construction said it provided at least 2,775 hours of pre-construction work on the project. But in an email to PC Construction’s lawyer, Cox said that the contractor got in touch with the developers offering pre-construction services, not the other way around. Cox said that suggests the developers didn’t set up its corporate structure to avoid paying its bills. “The absurd representation that the individual plaintiffs created a complex scheme to avoid its obligations is baseless and callous,” Cox said, adding threats to counter-sue and seek court sanctions to block legal maneuvering by PC Construction’s lawyers. The construction company’s lawyer, Timothy Connolly, declined to comment Friday. The suit alleges unjust enrichment, fraud, misrepresentation. The construction company is seeking more than $235,000, plus damages and legal fees. It has become increasingly popular in the construction industry to bring in a contractor before a development’s design is set, said Matt Marks, chief executive officer of Associated General Contractors of Maine, the state’s largest construction trade association. He said contact between builders and developers early in the process helps to get a contractor’s insights as the building is designed and construction schedules are set. It used to be done informally, Marks said, but, increasingly, formal arrangements are struck with detailed contracts setting out the tasks the builder will take on and what fees, if any, are to be paid. He said an arrangement calling for no fees if the contractor is chosen to build the development helps in two ways: It means the developer doesn’t need to budget for early work on the project, and it gives the contractor the inside track for getting the construction contract, Marks said. But the Midtown lawsuit illustrates the need to plan for many contingencies in the arrangement, he said, including what happens if the project falls apart. The complaint alleges that many of Federated’s corporate entities have been dissolved and a call to the company’s offices in Florida said its phone system was not set up to receive calls. Patrick Venne, a local attorney representing the developers, said that some of the companies set up for the development have “lapsed,” but the main firm in Florida is still operating. Jon Jennings, Portland’s city manager, said an outside law firm has been brought in to handle the city’s dealings with The Federated Cos. A lawyer with the firm has been in contact with Federated in recent weeks, he said. Jennings said the developer hinted at a lawsuit after city permits were withdrawn following the missed deadline in March, but so far neither side has gone to court. “We decided to kind of back away, and that’s where things stand,” he said. 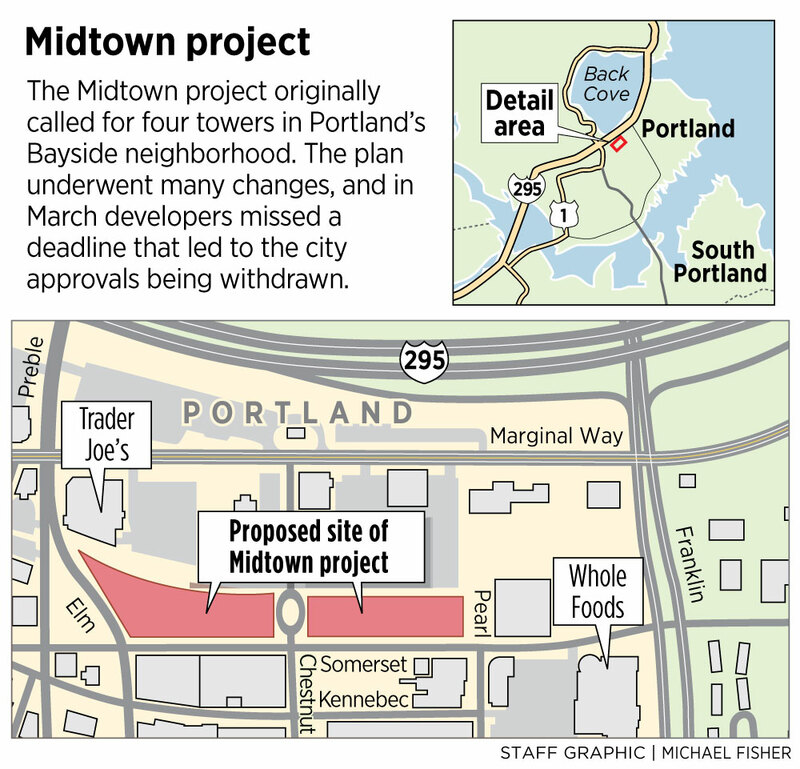 But Portland is eager to get a large garage built in an area that was once part of the midtown complex, Jennings said. The original garage for the project was designed primarily for use by residential and business tenants in the complex, he said, but other commercial developments in the area need parking to move forward. “Building this garage is critically important for the city and for this part of Bayside,” Jennings said. While the city is willing to work with The Federated Cos., which owns the land, it is looking at other potential partners to build the garage, the city manager said. In addition, the city took out an $8.9 million federal loan in 2014 to pay for part of the parking garage. The city had to act quickly to get the loan, he said, and now taxpayers are picking up the tab for interest on the loan while the project has languished. As of Friday, the interest bill has totaled $337,274, he said.